Finding an inexpensive method of exercise, especially if you travel can be a challenge. Many people love exercise balls for this reason. They are the perfect piece of equipment for low impact, versatile exercise. You can use exercise balls for full body workouts, strength training, agility and more. The three choices of exercise balls that we have reviewed below have topped the charts in the areas of durability, variety of sizes and colors, ease of inflation and deflation and other important factors as well. Out of the numerous types and brands of exercise balls that were researched, these are the most popular with customers and the best all around exercise balls. There are many different types and styles of exercise balls on the market today. Sorting through all of the choices can be daunting. The purpose of this guide and the reviews below are to provide consumers with the right information so sorting through the choices becomes much easier. If you have exercise and fitness goals that you want to accomplish and you are looking for a lower cost, easy to learn, convenient method of reaching those goals, you will love getting an exercise ball. This professional grade exercise ball allows users to improve many different things about themselves including core strength, balance, and overall agility. It works the abs, glutes, hips, arms, and many other exercise groups. It is designed with dense walls for the ultimate in support and durability. This exercise ball is rated to support up to a whopping 2000 pounds. Assembly is easy. Remove from the box and inflate with the foot pump and you’re ready to go. 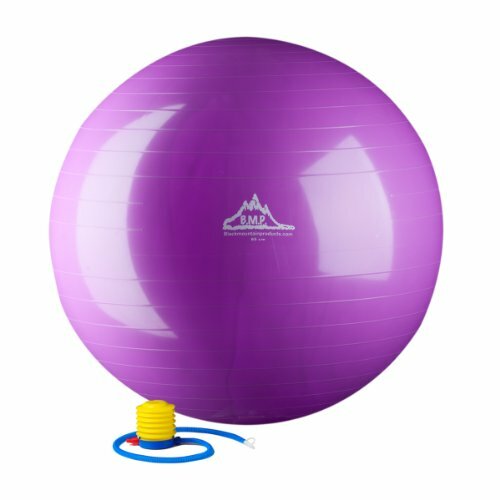 This long lasting, durable exercise ball is available in purple, black, red, and blue and comes with a manufacturer’s warranty. 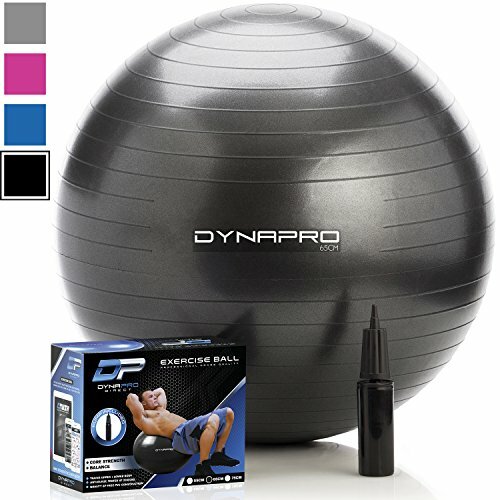 The anti-slip exercise ball from DynaPro will help improve your core strength, balance, flexibility, back health and more. This highly portable exercise ball can be taken anywhere and includes a convenient and easy to use hand pump to get it ready to go in minutes. The DynaPro comes in an array of colors including grey, pink, blue and black. It is also available in 3 different sizes to meet the different height needs people have. The DynaPro is anti-burst tested at 2000 pounds and can stand up to the toughest and most strenuous workouts. The Professional grade exercise ball comes with a pump, plug, plug remover tool and is made from the highest quality PVC material. There is a 100% money back guarantee if you’re not happy with the exercise ball for any reason, which contributes to DynaPro’s 5 star customer service rating. 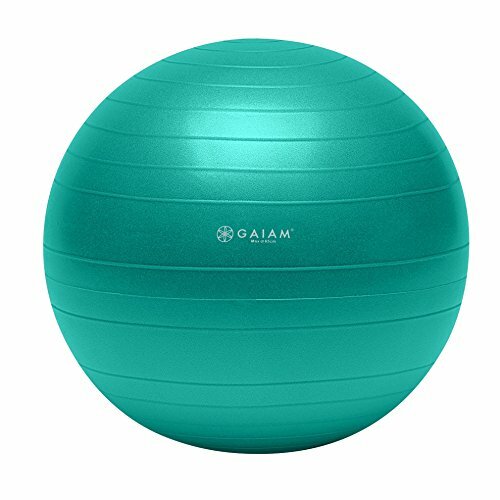 The Gaiam Total Body Balance Ball comes in three convenient sizes: 55cm, 65cm and 75cm. It is made of rubber and manufactured in the USA. This ball is perfect for working on many different muscle groups and helps improve your core. Along with the exercise ball, users will get a DVD and a pump for convenient inflation of the exercise ball. The DVD includes workouts that are designed by the fitness expert Tanja Djelevic and they are designed for all skill levels. Users will be taken through a series of workouts that include Pilates, yoga, and strength moves that will help you reach your fitness goals. The total DVD is 105 minutes long and is broken into three-20 minute segments that focus on upper body, lower body and abs. It also has three-10 minute segments called the Balance Ball Express. Exercise balls have been around for a long time but they have not lessened in popularity when it comes to getting a great workout for your core without putting a lot of strain or impact on your body. They can range in size from 30cm to 75cm that work for children all the way to very tall adults. The three choices of exercise balls that we are reviewing have topped the charts in the areas of durability, variety of sizes and colors, ease of inflation and deflation and other important factors as well. Out of the numerous types and brands of exercise balls that were researched, these are the most popular with customers and the best all around exercise balls. Continue reading below to learn more about how to choose an exercise ball that will fulfill your fitness needs and goals. With the information we have provided you will be able to sort through the many different choices and narrow it down to the one that will meet your needs and fit your preferences the best. An exercise ball is a piece of exercise equipment that works many large muscle groups in your body in a very thorough way. The ball itself inflates and you can use it as a workout bench, an office chair, a ball to do pushups and sit-ups on and much more. A good quality exercise ball can be used by people at every fitness level from the beginner to the much more advanced fitness enthusiast. Many people use exercise balls to help improve their back pain. Because of the core strength it can build, it can truly help with strengthening the muscles of the abdomen so less strain is placed on the back. Exercise balls come in many different sizes. The way that you determine which size is the right one for you is to look at your height. We have provided a basic chart below that gives the height ranges and ball size that works the best with your height. In addition to your height, you will need to take your weight into consideration as well when choosing the right exercise ball for your needs. If the ball is sized properly to your size, you will be able to sit on it and place your feet flat on the floor. Your knees should be level or slightly lower than your pelvis. You want your knees and hips to form a 90 degree angle. You r shoulders, ears and pelvis should be in a straight line. Most of the exercise balls on the market today are anti-burst and have weight ranges from 200-2000 pounds. You will need to look at the box to see what the anti-burst rating is. Because of the strength of these balls they are good choices for those that have s lot of weight to lose. They are also good to have when you have kids and pets around in case they get a hold of them. There are small and mini exercise balls as well that are used as props and are not meant to be sat on. The small and mini exercise balls are to be placed between the thighs or ankles and used as part of the exercise. Medicine balls – These weighted balls are made of rubber or leather that have been filled with sand or some other heavy material. They are used for power training, explosive training, rehabilitation, physical therapy and other uses as well. The larger the ball, the heavier it is, ranging from 2 to 30 pounds. BOSU balls – BOSU means both sides up. These balls are dome shaped and csn be much more versatile than the traditional exercise balls are. The flat and round surfaces can be used for a variety of different exercises. Some may be easier to do on the flat side and others may be easier on the rounded side. This type of exercise half ball can be used to improve balance and agility. Because of the variety of exercises that can be done with an exercise ball, if you are a beginner you might want to consider getting an exercise ball that comes with an instructional workout DVD so you can get the most from using it. You need to make sure that you are using the exercise ball the way you are supposed to and in a way that will benefit you and help you. Injuries can still occur if the equipment is used wrong so make sure you know how to use it properly. If there are any questions, there are plenty of videos on the internet or DVDs that are dedicated to exercise routines with an exercise ball. It is much better to start off with those and work your way into it slowly rather than risk injury and not be able to work out at all. There are a few things that you should do when you first get your exercise ball to make sure that it is in the right shape to use for your workouts. Below we have outlined the steps that you should do when you first get your exercise ball. Inspect the Exercise Ball – When you first get your exercise ball, take it out of the package and inspect it for any rips, holes, tears or other damage from shipping. Fold marks and creases are normal. Spread the ball out flat on the floor with the hole open. If the ball is exceptionally cold or hot to the touch, allow it to come to room temperature before you start inflating it. Remove the plug once the exercise ball has reached room temperature. Some exercise balls may come with an extra plug and adaptor in case you need them. Inflate the Exercise Ball – You will be inflating your exercise ball according to height and diameter not pressure so you need to know what the diameter is before you start inflating it. The easiest way to do this is to look on the ball for the maximum diameter and mark that height on a doorframe or wall. You will inflate the ball to reach that height and that mark on the wall will help you do that effortlessly. Start inflating the ball. This is easily accomplished using a hand or foot pump or an air compressor. If you don’t have any of this you can take the ball to a tire or repair shop and see if they will use their compressed air to inflate the ball. When the ball reaches the mark on the doorframe or wall, insert the plug into the ball. Use a yardstick from the top of the ball to the wall to make sure that you have it at the right cm inflation. If it does not reach the mark, add more air. Stop inflating the ball when you are comfortable sitting on the ball and it has reached the mark you have made on the wall. You should be able to push the ball in about 2 inches when it is at the proper inflation level. Do not over-inflate the ball. After 24 hours, recheck the inflation level to make sure it does not need any additional air added. You may have to inflate it a little more one or two times when you first start using it. Check for sharp objects before you use the ball. You want to be sure that there is nothing around that can tear the ball. Even though burst resistant exercise balls won’t explode, they can be torn so make sure the area you will be using the ball in is free from things that can damage it. Don’t use the ball outside. There are things like sharp rocks, sticks and more that can damage the ball. Don’t let the ball come in contact with materials that are printed with black ink because the ink can be transferred to the ball and leave stains and marks. This will not affect the performance of the ball, but the ink could be transferred to your skin or clothing. Clean the exercise ball regularly with a soft rag and warm soapy water to prevent germs and stains from messing it up. Don’t use harsh chemicals or abrasive cleaners on the exercise ball. You can lightly spray it with a disinfectant but do not soak it down and just let the mist rest on the ball and dry. Taking care of your body is very important to living a long life. Exercise balls have become a regular part of many people’s regular exercise routine. Exercise balls are not exceptionally expensive which makes them a popular choice for people looking for equipment without spending a ton of money. Having the right information to help you sort through the numerous choices available on the market will make choosing the right exercise ball much easier. Having the right equipment makes it much easier to stick with exercise programs even when you are traveling, since exercise balls are easy to deflate and travel with. Technology has truly changed the world for the better in many aspects. Unfortunately, there are still some downsides to the increasing span of technology….